Newsletter - Business and Entrepreneurship! Welcome to our community and we are excited to share our endeavor to reshape education with you all! On March 23rd we are hosting a Children’s Business Fair at our Studio. We are inviting young entrepreneurs, ages 8-12, to join us! We are providing an information night, online resources and support to those individuals that are interested in participating! You can find more information about the Business Fair on our website! Our current Expedition is The Children’s Business Fair! Over the next 6+ weeks our young Explorers will be learning all about entrepreneurship. Using a variety of resources, our entrepreneurs will learn about Design Thinking, Growth Mindset, Persistence & Grit, Business Planning and ultimately the Sales Experience! We are adapting an Entrepreneurship curriculum from Venture Lab, a non-profit dedicated to teaching young learners about business skills, to help guide our Explorers through the business plan process. We have connected with local business owners from Santa Cruz to inspire our learners with authentic business stories. Thank you to the Santa Cruz Farmers Market, Luma Yoga, Pacific Trading Co.,The Penny Ice Creamery and many more for supporting young entrepreneurs! A great blog post from Edutopia. Authentic experiences like starting your own business help to drive student engagement and teach relevant skills to our young learners! We are so happy to have a resource like Venture Lab to incorporate into our Expeditions. The Entrepreneurial mindset translates beyond business development and really teaches valuable 21st Century skills to young learners. Please Support Our Continued Growth at Expedition Academy by participating in our GoFundMe Fundraising! We look forward to sharing our continued progress on Expedition Academy Santa Cruz! 2 Days Left in 2018! As we close 2018 in our first year as a new school, we want to welcome new followers of our community and give thanks to those that have been supporting and following us on this great adventure! This is also the Season for Giving! Your philanthropic support is essential to our school. Your charitable giving supports Expedition Academy’s growth, improving our academic as well as our daily operations. Support Our Young Learners - Donate Today! We are hosting a screening of the critically acclaimed education documentary Most Likely To Succeed(www.mltsfilm.org) for parents interested in learning more about the changing landscape in education. Come to see first-hand what our Explorers have been creating on our latest Expedition! This event is open to the public. If you are an interested family, local organization or simply curious about the changing face of education, this is the event for you! We will be hosting our Open House event for prospective families. We look forward to giving parents and their eligible children a glimpse into the Expedition Academy Santa Cruz experience. We here at Expedition Academy Santa Cruz are looking forward to 2019! Our current Expedition, Experiment in Space, enters into the independent Action Project stage for our young Explorers. Action Projects allow students to choose a project of their own passion interest, related to the Expedition, that will demonstrate their learning and growth for the current project! Our Space Experiment code has been sent to the Ardusat satellite, students have been diving deep into the Scientific Method, Coding with Scratch, Arduino and mini-apps with Bitsbox! They will combine all of these experiences and choose how they want to demonstrate what they have been learning. Come to our January 25th Open Studio and you will see scientific experiments from space to the surface, apps and animations as well as creative works such as creative writing projects and artistic designs! We look forward to sharing our continued adventures at Expedition Academy Santa Cruz! Newsletter - 'Tis the Season! Our current Expedition, Experiment in Space, has its main focus around observing Earth from space via satellite. We are using an Arduino-based technology that is aboard small satellites orbiting the Earth. This might sound familiar to some of you as the term Cubesat has been talked about in the news quite a bit lately! From the latest Mars landing to observing the fires in California, the same technology that our Explorers are using in their Expedition has been serving Scientists around the world! This Expedition is definitely all about STEAM, from scientific experiments to coding to creative writing, we are bringing it all together! We have had an amazing start to our first year! Adventures, Excitement, Laughs and New Friendships. We could not have done it without the support of our community, the belief in what “could be” a new educational experience for our children. We are so very thankful for this opportunity and look forward to sharing our journey with you for a long time to come! Expedition Academy Santa Cruz - We are hosting a Public Open Studio Event at our Westside Studio for interested parents in our middle school program. Every Expedition ends with a culminating experience called Open Studio. Our Explorers put their learning on display in the form of Action Projects that integrate a variety of subject areas and personal interests! Expedition Academy Santa Cruz - We are hosting a Parent Coffee Q&A at our Westside Studio for interested parents in our middle school program. Come Meet the Founders! Visit the studio and learn about our program! This is a Parent-only event and does not have any scheduled activities for younger visitors. Welcome to our community and we are excited to share our journey with you all! Interested in learning about the Expedition Academy program for your child? We are hosting a Coffee and Q&A for Parents of children in grades 4-7. Come visit the studio, meet the founders and learn about our program! Our Explorers put their learning on display at the end of every Expedition. Come join us to see what our latest learning journey has produced! A unique part of the Expedition Academy Santa Cruz experience is the way in which we utilize Specialists in our educational program. We have four new Specialists to introduce in this Newsletter and we are excited to share with you all how they have truly enhanced our students educational experience. A learning opportunity at Expedition Academy Santa Cruz is a time where students can immerse themselves in an experience that allows them to apply their current knowledge while simultaneously learning new skills. When our Specialists visit the studio, it is an opportunity for students to apply their learning, test their progress and challenge themselves to excel. All of our Explorers are learning Spanish as their foreign language this year at Expedition Academy Santa Cruz. In addition to using adaptive technologies to learn Spanish basics we provide immersive conversational learning experiences that encourage fluency and comfort with the language. We are so excited to have Jenny with us on this journey! Writing and Communication are essential skills in the 21st Century. Sarah has taught middle and high school English Language Arts since 2001. Her interest in expanding school literacy to become more engaging, relevant, and inclusive has fueled her continued journey as a student herself. Sarah has a MA in Education, a MA in Educational Leadership, and is currently getting her PhD in Education at UCSC. Sarah's research focuses on how students learn literacy skills through communication with real audiences for real purposes. We truly appreciate Sarah for bringing this real world approach to literacy to Expedition Academy Santa Cruz. A major component of our educational program is the incorporation of Social Emotional Learning (SEL) and Mindfulness. Tamara is a certified Mindfulness educator, yoga instructor and experienced teacher in Life Sciences. Her focus with students is to help support developing a growth mindset and teach them tools for navigating their own personal growth. We are so happy to have Tamara joining us! We incorporate art and artistic expression throughout our program. Erik Bowman has taught art at both the high school and middle school levels for over twenty years. We are excited to have Erik bring his expertise and experience to Expedition Academy Santa Cruz! We look forward to sharing our continued adventures at Expedition Academy Santa Cruz with you! Newsletter #11 - The Journey Begins! Our first school year is off to a glorious beginning. Our 15 ¨Explorers¨ have immersed themselves in many new experiences as we focused on building the foundations of our learning community that will support us as the year unfolds. The Expedition Academy program is composed of 3 elements: Campfire, Essential Skills, and Expeditions. Campfire is a time when we circle up and meet as a group to focus on interpersonal communication, problem solving, self-governance, and social/emotional learning. Essentials Skills is the morning block of time when students work on their personalized learning goals related to reading, writing, math and Spanish. Expedition is the afternoon block of time when students work on extended interdisciplinary projects. Here is a brief update on what our Explorers have been working on during our first 2 weeks. Morning Campfire: Launching each day in a unique way. A momentous occasion: Explorers guiding their own Campfire for the first time! Our first weeks of Campfire have been all about building our school community through shared challenges: camping, group problem solving activities, learning to communicate in a group setting. In the weeks ahead our Explorers will create their own community rules as well as begin taking on the challenge of self-governance. Campfire travels with us wherever we go! First steps at independent goal setting and time management. Our first weeks of Essential Skills have been focused on getting Explorers organized and trained on the use of their learning tools. Explorers began setting their own goals...their first step in taking ownership of their own learning journey. Flexible Learning Spaces allow for various types of learning experiences. Finding comfortable spaces where each student feels they can focus and accomplish their goals. Learning about our city’s history at the Santa Cruz Museum of Art & History. Continuing learning opportunities with Experts like our State Park Rangers at the Santa Cruz Mission. Self-exploration and data collection for our future Action Projects. Our first weeks of Expedition have included Field Trips to the MAH and Santa Cruz Mission for our Settlers of Santa Cruz Expedition. Exploring our community, meeting with Experts and experiencing learning opportunities in the real world is what Expeditions is all about. We will have a booth at the West Cliff Open Streets event coming soon in October! Mark your calendars and come say ‘Hello’! The design of Expedition Academy Santa Cruz has many influences but much of our core DNA is built upon the philosophical foundations of Outward Bound. At its core Outward Bound is a learning process that immerses individuals in an unfamiliar environment, presents them with real challenges, skills, and opportunities that lead to a deeper understanding of self, community, and the natural world. The Campfire and Expedition elements of Expedition Academy’s program are directly linked to the work Outward Bound has been doing for the past 75 years. Outward Bound students circle up multiple times each day just as we will at Expedition Academy. Outward Bound students follow an Expedition Learning Cycle just as we will. We are hosting a screening of the critically acclaimed education documentary Most Likely To Succeed (www.mltsfilm.org) for parents interested in learning more about the changing landscape in education. The film will be followed by a discussion and Q&A with the founders. Come meet the founders of Expedition Academy Santa Cruz and discover a new way to learn! We have Summer activities for students! We have classes in Robotics, Chemistry, Design and Nature Science! Check out our week-long activities and sign up today! The following article is a great read on the history of Outward Bound, its founder Kurt Hahn, and how a partnership between Outward Bound and Harvard University led to the founding of Expeditionary Learning, a national organization that is working to transform classrooms and school districts across the U.S. In 1991, EL Education was born from a partnership between Harvard Graduate School of Education and Outward Bound, USA. We joined the character-infused philosophy of Outward Bound founder Kurt Hahn, which focuses on teamwork, courage, and compassion with an active approach to learning crafted by leading Harvard scholars and created 10 founding principles for the EL Education model. Just as students often think of phenomena such as magnetism or gravity as “magical” until they are given a “scientific” lens to frame their understanding Outward Bound students often describe their learning experiences on a course as “magical”. Experienced Outward Bound instructors know that the “magic” is in the many interwoven elements of the learning process which can consistently deliver these deep learning experiences through the thoughtful application of the Outward Bound learning process. One key element of the Outward Bound process is the use of metaphors to help students process their daily experiences. The use of metaphors will be a powerful learning tool that will help students understand their learning journey at Expedition Academy. For a deep dive on why the Outward Bound process creates deep, “magical”, learning we recommend reading up on our “scientific” understanding of learning and the human brain. The Outward Bound process works because it taps into the deepest parts of our brains in powerful ways. Expedition Academy Santa Cruz Open House Event! On Saturday, May 12th, we will be hosting our fourth Open House event for prospective families. We look forward to giving parents and their eligible children a glimpse into the Expedition Academy Santa Cruz experience. 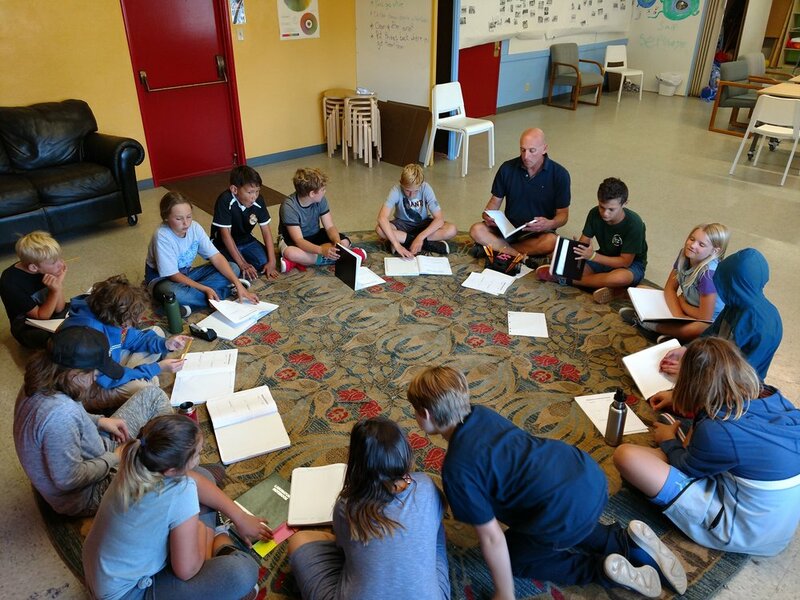 Our goal is to infuse the elements of powerful learning experiences Dintersmith identifies into the daily fabric of Expedition Academy Santa Cruz. We are inspired by the way other schools such as High Tech High engage their students with projects that clearly incorporate all the elements of PEAK. Look for the elements of PEAK in the following video from High Tech High. Cultivating a growth mindset in our students and in ourselves....this summer we are going to be students at Explo where we are going to continue to develop our abilities to design and implement PEAK learning experiences for our students at Expedition Academy Santa Cruz. We firmly believe that by continuously putting ourselves in the role of student we not only develop new skills and mindsets but we also develop our empathy for the daily struggles and successes that our students experience which helps us guide them through their learning process. We are excited to announce our participation in a week long Critical Making Workshop hosted by ExploStudio in Norwood, Massachusetts this summer. Explo has been running summer and after-school programs for over 40 years following the motto: Learning Through Exploration. We are excited to learn new skills and mindsets as we partner with their curriculum development team on designing our first year of PEAK infused Expeditions (our term for extended interdisciplinary projects). The Santa Cruz community is full of experiences and experts that can help our students through their PEAK learning experiences. One of the major cornerstones in the Expedition experience for students is the Student Action Project. Students will have the ability to apply their knowledge learned in an expedition to their own creative projects. To prepare for these exciting projects we are developing a relationship with the Santa Cruz Idea Fab Lab to provide a workspace for student creative projects. We will not just be visiting the Fab Lab for a field trip, we will be using the space regularly to explore our creative design ideas. Whether students want to use 3D printers, laser cutters, wood routers or electronics, the Fab Lab will be an amazing space for our students to unleash their creative potential! Welcome to our community and we are excited to share our endeavor to reshape education with you all! In this issue we are sharing our vision for student agency and resources on how student-empowered learning is accelerating learning. Tickets for our Open House are available on Eventbrite. Come check out the studio and get taste of what Expedition Academy offers for middle school students in Santa Cruz. Meet the founders, learn more about the personalized Essential Skills time, exciting interdisciplinary Expeditions and the social emotional approach with Campfire. Spread the word to interested families, bring them with you to Open House and get them on the Newsletter list! We have 4-weeks of summer programs available to students in 4th through 8th Grade starting in July! From Chemistry and Natural History to Robotics and Design, come check out the amazing adventures you can have this summer! The learning environment at Expedition Academy is centered around student agency. The flexible studio space is designed to allow students to create their own optimal learning spaces. During Essential Skills time, students may choose to read on a couch, tackle math concepts under the shade of a tree or setup a table for a group conversation, in spanish, outside in the sun! When we work as a team on Expedition projects, students collaborate as a team and also have the freedom to explore their own related passions outside of the group with their independent action projects. Our Campfire meetings are structured to be student-led and our school rules are created by the students themselves to encourage ownership of the community learning experience. We believe in student agency and the power it brings to the learning process. From the executive producer of Most Likely to Succeed, Ted Dintersmith explores a variety of school models across the country. Education is in need of an overhaul and to no surprise, those that incorporate student agency and innovative teaching practices are poised for success! In order to properly prepare students for the future: high school, college, career and beyond, we need to provide them with purposeful learning experiences based in real world situations. Giving students the power to choose, learn from mistakes and tackle problems with real tangible outcomes is the way real innovation happens in education. New schools and organizations across the country are starting to realize the gains of this type of educational environment, the time for a new way to learn is now. In a recent visit to D. Tech High, we had the opportunity to see first hand what is possible when you give students agency in learning. D. Tech High provides many opportunities for students to follow their passions. From project partnerships with local businesses in the classroom to their dedicated Lab Day where students choose their own learning pathways one day every week! Their students are actively engaging in their communities and making a difference on their terms. Teaching music, writing plays, creating apps for educational equality or engineering go-karts just for fun, students are accelerating beyond any traditional education environment and they own the outcomes! We are offering Summer Programs at Expedition Academy Santa Cruz! From Chemistry to Programming, Creativity to Exploration, we are happy to announce that we have summer activities for children 9-12 at the studio and beyond! All of our sessions are week-long from July 9th through August 3rd. Check out our Summer page and Register Today! We are fortunate to be able to screen the independent film Most Likely to Succeed. This film really brings home the principles and vision we have for Expedition Academy Santa Cruz and helps clarify our process for interested parents and students. If you are considering our program, want more information or are just curious about what the next movement in education is all about, come join us! We will be screening the film at our studio from 6:00pm - 7:30pm on Tuesday, April 3rd. There will be time for a short Q&A afterward. Grab your tickets on Eventbrite! As Applications begin to roll in for the 2018-2019 academic year, we have been receiving questions about our Personalized Learning or Essential Skills time. The beginning of each day at Expedition Academy Santa Cruz starts with a group Campfire followed by Essential Skills where students work on their personal learning goals before lunch. At the heart of Essential Skills is the student. Students choose which topic(s) they want to focus on each day, set their goals for the day, week, month, etc. and truly own their learning progress. On Saturday, March 24th, we will be hosting our third Open House event for prospective families. We look forward to giving parents and their eligible children a glimpse into the Expedition Academy Santa Cruz experience. Reserve your family ticket on Eventbrite! Essential Skills time at Expedition Academy Santa Cruz is different than independent study and is our own unique model of what is typically referred to as Personalized Learning. Essential Skills does involve students working on their own and at their own pace using a variety of online tools or physical resources. This time also involves the Guide who helps students create and track their learning goals as well as selecting the correct tools for the job. There are also peers available during this time, we do not want students to think that they have to sit silently by themselves and never interact with their classmates, quite the contrary. We envision learning groups tackling common learning goals, peer reviews of finished work, learning discussions and peer tutoring also being a major part of the Essential Skills time. Another key difference to our Essential Skills time is the incorporation of Specialists. 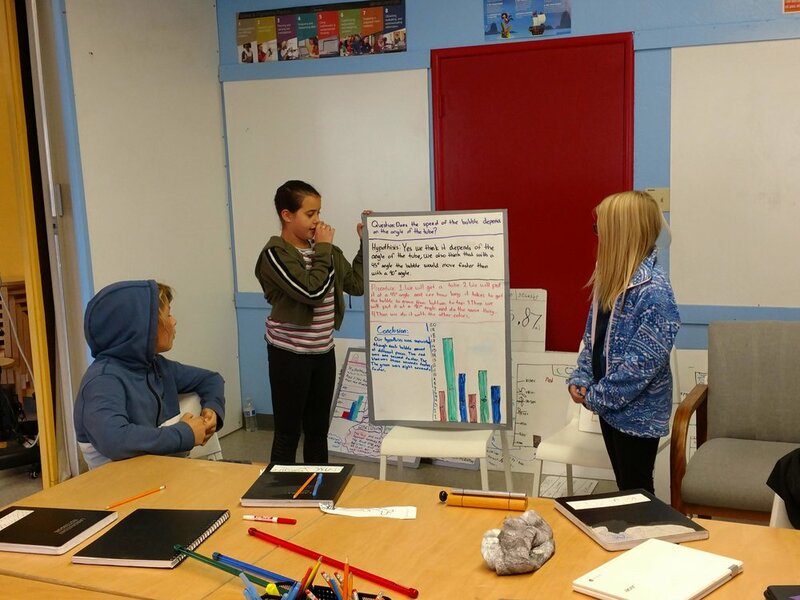 Specialists in Math, Writing and Foreign Language will visit the studio regularly to work with students individually or in small groups on key concepts related to learning goals. Specialists will work with the Guides to identify key areas that students need to master in order to accelerate their learning and will be instrumental in the student goal setting process. So, what does Personalized Learning look like? Check out our resources below. Every student will be working toward their own individual learning goals during Essential Skills time. Here is a great example of the power of adaptive learning tools that meet students where they are and assist them in accelerating at their own pace. Many people know Khan Academy as an independent Math learning tool. Sal Khan has not only expanded his content offerings but has also created a school, Khan Lab School, around the principles of Personalized Learning. We are looking forward to visiting the Khan Lab School next month as part of a special program sponsored by our supporter Silicon Schools Fund. We do not see online tools being a stand alone replacement of teaching. We want students to learn how to use all kinds of educational resources to attain their learning goals. The combination of Essential Skills and interdisciplinary Expeditions are what we see as a path to success for 21st Century learners. 1. Personalized Learning as it relates to the part of our school day that we call Essential Skills. 2. How social emotional learning is integrated into what we call Campfire. If you have not yet reserved your free tickets for our Open House event or perhaps you missed our first Open House, please join us! On Saturday, February 24th, we will be hosting our 2nd Open House event for prospective families. We look forward to giving you a glimpse into the Expedition Academy Santa Cruz experience. 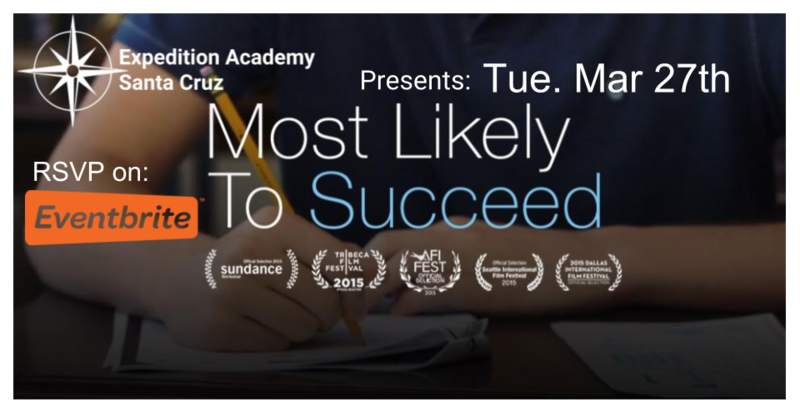 We are hosting a screening of Most Likely to Succeed at our Studio on February 28th. This is a great film for parents who want to learn more about the changing landscape of education. Join us for a Screening and Q&A! 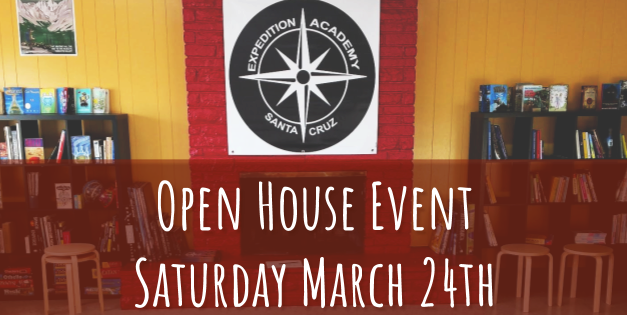 Come to our Open House to experience a day in the life at Expedition Academy Santa Cruz. Email us your questions or arrange a time to visit us in person to learn more about program. We will have open applications until all spots are filled. Campfire is a daily element of Expedition Academy Santa Cruz, a time during which we join together in a circle and relate to each other as human beings. One of the main goals of Campfire is to help students develop the core competencies of Social Emotional Learning (SEL). The elements of SEL can be described in multiple ways and there are a variety of approaches used to teach these skills. At Expedition Academy Santa Cruz our Essential Skills time is the personalized learning segment of a student's day. Having personal learning goals, pacing one's self in achieving those goals and learning how to learn are not the skills normally taught in traditional school models. This book is a fantastic reference for learning more about the process or guiding your own personal learning experience. Many people wonder how Personalized Learning engages and challenges students. If students are allowed their own choices in the learning process, how will they drive themselves to continuous improvement? This article dives into examples from a Bay Area charter high school focused on student-centered, project-based learning models. Referenced in our blog related to Campfire and Social Emotional Learning, Valor Collegiate Academy has integrated weekly circle into their school experience. Thank you for joining our community! We look forward to sharing our continued journey. As we began the process of designing Expedition Academy Santa Cruz we relied heavily on our own experience as educators over the past 25 years. Our vision for Campfire is to build social emotional learning into the daily fabric of Expedition Academy. While the experience of Campfire will differ from day to day, the long term goal is the development of social emotional competencies and awareness. Social emotional skills are no different than math skills or keyboarding skills, they must be practiced over and over until they become second nature. Our goal with Campfire is to create a safe place for students to learn and practice making choices, collaborating, building resiliency, reflecting on individual and group experiences, as well as developing a sense of empathy. Campfire begins on the first day of school and continues daily through the last day of school. Sometimes Campfire will only last 5 minutes, other times it will last as long as it needs to in order to address the challenges that present themselves. 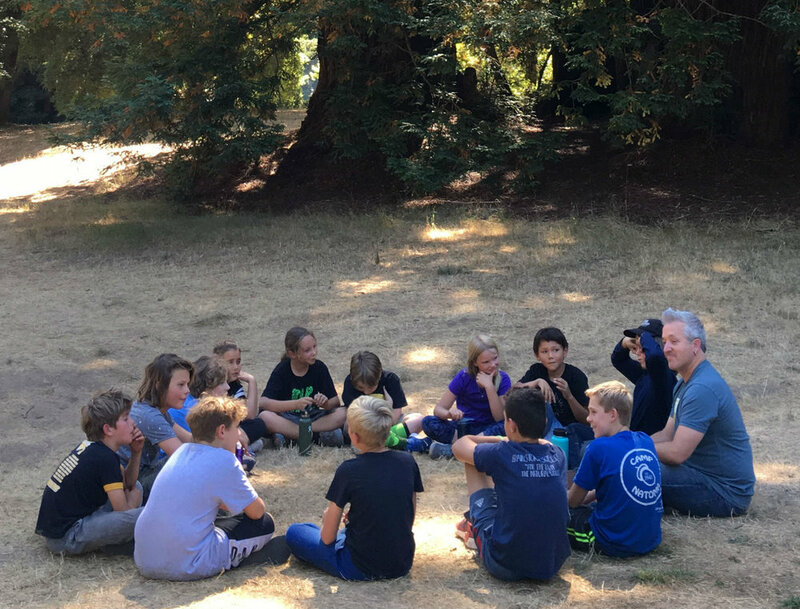 Our first 3 full days of the school year will occur camping at Little Basin in the Santa Cruz mountains in order to set the tone for what Campfire is all about. Many redesigned schools are embracing the power of sitting in a circle (Campfire) with a small group of students to practice developing social emotional skills. The following video gives a brief look at how another school, Valor Collegiate Academy, is using small student circles to develop social emotional skills. Tonight is our first public event at the Santa Cruz Museum of Art & History! We are looking forward to sharing our vision for a new approach to middle school education in Santa Cruz. We will share pictures and takeaways from the event for those of you who may not be able to attend and we look forward to sharing more opportunities like this one to learn about our educational movement. We are almost ready to release tickets to our Open House. Stay Tuned! Newsletter members will be the first to know when tickets are available. You will be getting a headstart on the Eventbrite reservations when they open up! Spread the word to interested families and get them on the Newsletter list! The theme for this week's Newsletter is Flexible Learning Spaces. We truly believe that putting students at the center of the learning environment is a key component to shifting the student mindset toward ownership of their own learning. Tonight at our screening of Most Likely to Succeed and in our student design activity, this theme will be at the forefront. Learning environments play a big part in student engagement. If you asked students, "What type of learning environment would you like? ", do you think they would choose the traditional lines and rows model for classrooms? In this book, lies one such endeavor to answer the question. At Expedition Academy Santa Cruz you can expect to never see students sitting in linear rows, unless it is by their own choice. One of our learning studio spaces is currently nicknamed, The Cafe. We strive to keep our learning studio flexible to student needs so that they can maximize their engagement in whatever they are working on. Our entire school model puts students at the center of the experience. Flexible learning spaces is just the beginning. Kayla Delzer makes some great points on the power of student-centered learning spaces and has really made an effort to spread the word in educational circles. We have many influences that drive our design of the learning environment at Expedition Academy Santa Cruz and find that Kayla Delzer has really put her finger on the pulse of many key themes. We are thrilled to announce that our January 31st Launch Event at the Museum of Art and History has SOLD OUT! We are looking forward to hosting 20 students and 80 adults for a lively and informative evening. If you did not get a ticket we encourage you to add your name to our waitlist on Eventbrite. Open House for Expedition Academy Santa Cruz will be Saturday, February 17th. We will be posting the free Open House RSVP tickets on Eventbrite. Space is limited in our studio and we want to make sure that we spend quality time with all who attend. There will be three sessions during the day, tentatively scheduled for 10am, 12pm and 2pm. Stay tuned for official times and RSVP information. 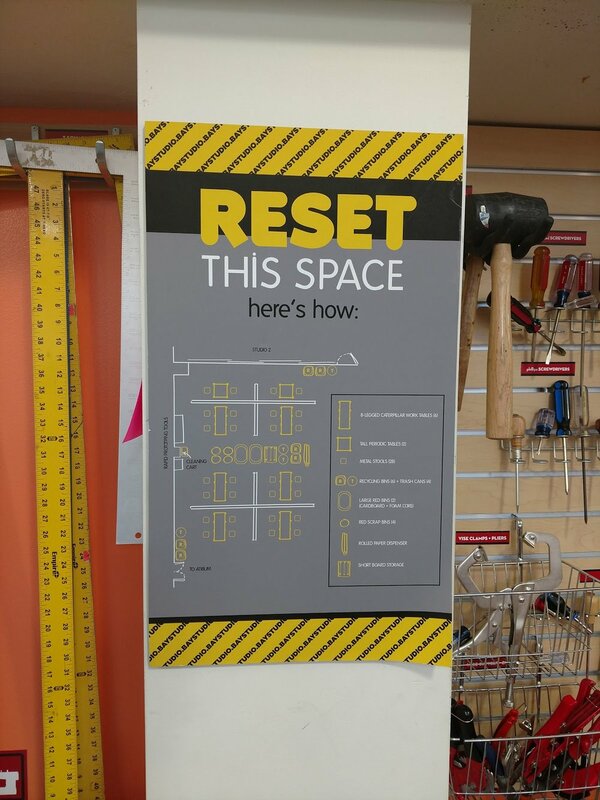 We have been hard at work creating a space for our learning community to unleash their creative and collaborative spirit. Our learning studio has the flexibility to meet individual and group learning needs with a multitude of different configurations. Whether it is a comfortable spot to get lost in a book, a quiet space to work on math challenges with a specialist, or a place to make a mess with an experiment, our studio has the capacity to quickly transform to meet different learning goals. Did you know we have a full kitchen too? Are grades essential to the learning process? At Expedition Academy Santa Cruz our number one goal is for students to own their own learning. The student voices in the following story show how removing the external motivation of grades creates a completely different learning experience for students. 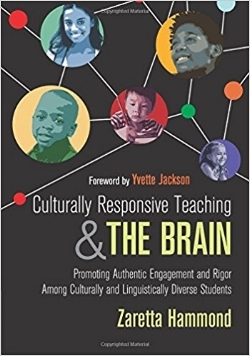 What Would a Brain Based School Look Like? 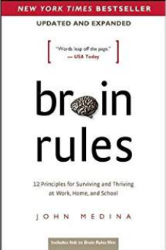 Several years ago we attended a presentation by neuroscientist John Medina who authored the bestselling book Brain Rules. After detailing our current understanding of how the brain functions in the learning process he then speculates on what a school design based on our knowledge of the brain would be like….think the opposite of a traditional school structure. Why Did Blue Man Group Start a School? This TED Talk with Matt Goldman identifies the guiding principles that formed Blue Man Group and the starting of an innovative school on the East Coast called Blue School. Many of the ideals shared in this talk align with our own at Expedition Academy Santa Cruz. We especially love the way their middle school students went through a process of defining the values of their learning community which is a process we will be guiding our students through each year. Jan 31 - Launch Event SOLD OUT! We are looking forward to hosting 20 students and 80 adults for a lively and informative evening. If you did not get a ticket we encourage you to add your name to our waitlist on Eventbrite. We are setting things up! 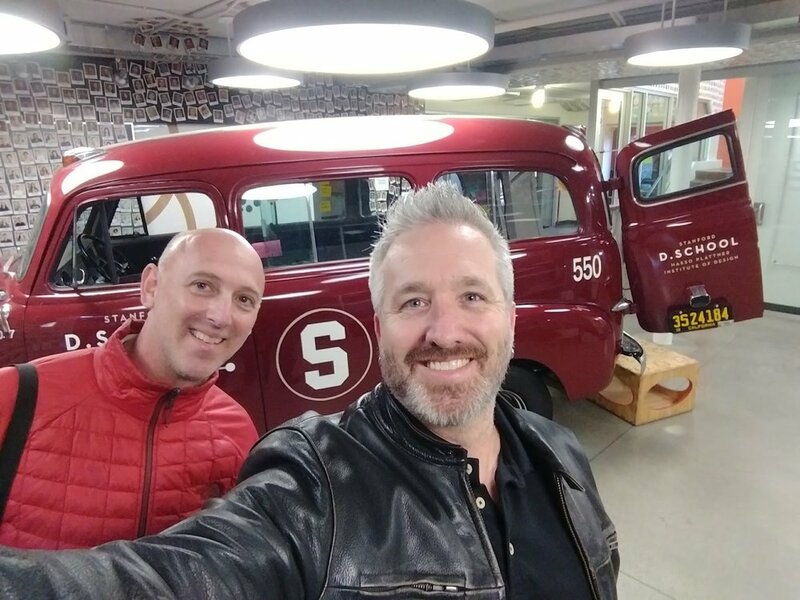 In anticipation of setting up our first year studio space we decided to hit the road and tour the d.school at Stanford University. We have been inspired by d.school workshops, books, and individuals over the past several years. We specifically wanted to get a feel for how they use their physical space to foster creativity and collaboration in their interdisciplinary teams and to see how some of their flexible space designs could apply to the learning studio we are creating. Needless to say, we were inspired and can’t wait to show you the space we want to present the students with! In addition to setting up our physical site we are actively involved in establishing partnerships with experts in the local community to help inspire our students with amazing learning Expeditions. We are really excited about our most recent Expedition planning session with a local guitar maker. From living trees to making music, we are preparing an Expedition that is truly unique. Students will be learning everything from the trees that grow to produce the wood for guitars, crafting the instrument and ultimately seeing it play in performance. We are looking forward to finalizing this Expedition for the 2018-2019 school year and will be sharing the details of how it develops along with the other amazing experiences we have in store at Expedition Academy Santa Cruz. Can a ‘No Excuses’ Charter Teach Students to Think for Themselves? Several large charter school networks that have sent students on to college found that their students were unprepared for the challenges of college despite being “academically prepared”. The charter school networks researched some of the reasons why their students were not succeeding in college and then they implemented a redesign of their learning models. The school redesign teams added the same 3 elements that make up a day at Expedition Academy Santa Cruz: Campfire, Expeditions, Self Paced Essential Skills. Sir Ken Robinson is one of the foremost experts on creativity and education. The following TED talk has been viewed 49 million times in the past 11 years. Need some inspiration about the need to change current education models? Go no further, start here. MIT Media Lab Recommends Lifelong Kindergarten? We have all heard the saying “everything you need to know you learned in kindergarten.” But according to Mitchel Resnick of the MIT Media Lab’s Lifelong Kindergarten Group it is not what you learned in kindergarten that is so important, but how you learned it. In his new book Resnick argues for educational institutions to embrace the learning processes often found in kindergarten in order to foster creative, and lifelong learners. 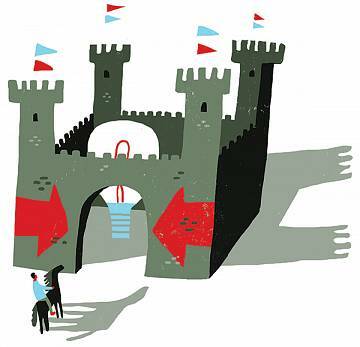 Resnick describes the 4 building blocks of creativity as Projects, Passion, Peers, and Play. These 4-Ps are fundamental elements of our approach to learning at Expedition Academy Santa Cruz. And yes, we also believe that WHAT you learned in kindergarten is deeply important!